We’re all about summer salads here at Anytime Fitness headquarters. Because who wants to cook when it’s 85 degrees and sunny outside?! I don’t know about you, but I’d rather be outside enjoying that weather! Not only are salads a cinch to throw together – just one bowl – they pack a pretty powerful nutritional punch, too; so much dark leafy green, fresh veggie, lean protein and healthy fat goodness! I’m not kidding when I say I eat a variation of this combo nearly every single day. It’s bursting with flavor and is super satiating! Get creative with your salads because anything goes! Here are 8 more healthy salads packed with fresh ingredients to power your through hot summer days. Your body will thank you. 1. Roasted asparagus & red pepper quinoa salad by A Nutritionist Eats. Make this flavorful salad on Sunday, and you’re set for a week of lunches. Oh, and it’s delicious, too! 2. Arugula salad with blue cheese and candied pecans by The Hippie Triathlete. This flavor combo hits all the taste buds – sweet, salty and bitter… and, oh so good! 3. Shaved Brussels sprouts and sweet potato salad by A Couple Cooks. Both comforting and clean, this is a super food salad that’s simple to make. Add your favorite protein for a bit more staying power. 4. Cool melon salad with hot bacon by Eating for England. You can’t ever go wrong with bacon, right?! Paired with cantaloupe, you’ve got a flavor explosion. 5. Maple tossed puy lentils, strawberry, asparagus and rhubarb salad by Green Kitchen Stories. This salad is a tasty combination of in-season fruits and veggies. Loving the tart rhubarb! 6. Chicken bacon avocado salad with roasted asparagus by Pinch of Yum. This yummy one-bowl salad is super fresh and filling, simple to make and can be served hot or cold. 7. Fall steak salad with sweet potatoes, avocado and maple vinaigrette by Fresh Tart. Don’t let the word “fall” fool you; this salad is perfect for a summer lunch, too. 8. 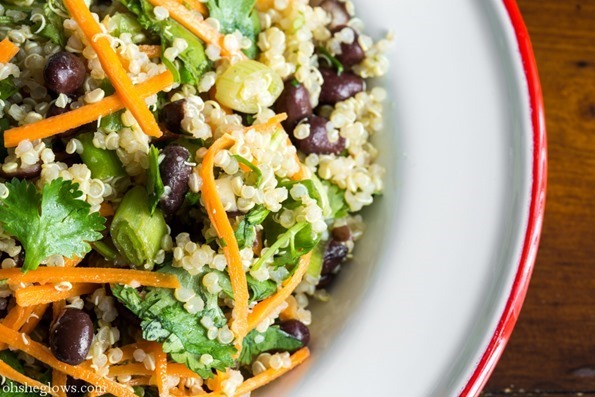 Cumin lime black been quinoa salad by Oh She Glows. Make this salad the night before to the let flavors marinate. Your taste buds will thank you! What’s your favorite salad ingredient?